Comfort food for cold winter nights, using smoked haddock for great flavour, and prepared frozen mash for ease and convenience. Place the haddock in a deep frying pan with the milk. Bring to the boil over a medium heat, then set aside for 5 minutes. Meanwhile, prepare the mashed potato according to the pack instructions, then allow to cool slightly. Remove the fish from the pan using a slotted spoon, reserving the milk. Place the haddock in a mixing bowl with the potato. Mix together with a fork, leaving the fish in large flakes if possible. Season with black pepper and add a splash of the reserved cooking milk to bind - the mixture should be firm but not crumbly or dry. Divide and shape into 4 rounds with your hands. Lightly dust each fishcake evenly with flour. Heat the butter and oil in a frying pan over a medium heat. When bubbling, add the fishcakes. Cook for 3 minutes on each side, or until golden. Remove from the pan and keep warm. Wipe the pan clean using a piece of kitchen paper, then add the crème fraîche, wine and 1 tablespoon of the reserved milk. Return to the heat until just below the boil. Serve the fishcakes with the hot sauce, steamed baby spinach and some lemon wedges. 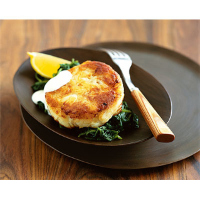 Make the fishcakes to the end of Step 3 and place in the fridge until ready to cook. If substituting fresh mashed potato, chill the fishcakes well before frying.